At Timberwise we cover a wide variety of property care issues. Although we are best known for our timber and damp services we are also specialists in structural repairs. In this article, we touch on structural repairs and in particular crack stitching and lateral restraint. 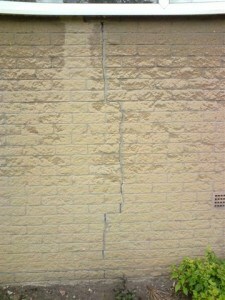 The cracks usually run vertically near corners or in ‘steps’ when running from windows or door openings. Roof spread often causes cracks to run down in steps from high up on a corner. Whatever the reason for the cracking, the fault can often be stabilised by placing stainless steel helical bars or wires across them to stitch them back together. The bars, or wires, are embedded in the mortar joints either side of the crack and bonded into position with a cement or epoxy grout. The number of ‘stitches’ inserted will depend on the length and position of the crack. The spacing between the helical bars is usually no more than 450 mm. Where lintels over window or door openings have failed, it is possible to create structural ‘beams’ in the masonry above which take on the load previously carried by the lintel. When this is required, two helical bars are embedded in each mortar bed. These repair methods significantly reduce the amount of dismantling and rebuilding that might otherwise be needed. Some structures suffer from insufficient bonding between the walls and the internal floors or roof. The result can be bulging or bowing of the walls. Stabilisation is achieved by inserting lateral restraint ties through the external walls, anchoring them to the floor joists within. Sufficient ties are installed to spread the load and prevent further movement. A number of repair strategies are available for the various combinations of wall construction and floor layout. Timberwise has many years of experience installing lateral restraints on buildings of all shapes and sizes. From domestic houses to large commercial properties we have the experience you can trust. If you suspect you have a structural problem in need of repair give us a call on 0800 288 8660 for advice or to arrange a survey to ascertain what repair is right for your property.